Andre Villas-Boas has dismissed suggestions he has tried to change too much, too soon at Chelsea as he ponders whether to stick or twist for tonight’s crunch Barclays Premier League with Manchester City. The Blues host leaders City having bounced back from their worst start to a season since Roman Abramovich bought the club. Some critics accused the 34-year-old of rushing Chelsea’s transformation from a side who defend deep and rely heavily on power and pace to one who mirror the style of European champions Barcelona. 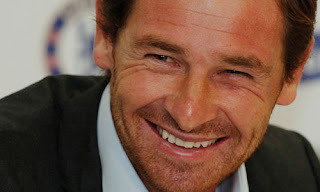 Despite a run of five defeats in nine games, Villas-Boas has repeatedly insisted the Blues’ new cavalier philosophy would not be abandoned. That was until Tuesday night’s Champions League win over Valencia, although Villas-Boas revealed that was down to events on the field rather than a deliberate ploy, rejecting the obvious implication Chelsea were not yet ready to fully implement his instructions. Asked if he had changed too many things, too quickly, he said: “No, I don’t say that.” Yet, whether by accident or by design, the spectacular success of Chelsea’s approach against Valencia has given Villas-Boas a dilemma ahead of another possible do-or-die game tonight. The Portuguese has admitted his side must “find a way” to beat City, who are perfectly capable of holding onto the ball in the same way as Valencia. Games between the Premier League top six have been nothing short of spectacular this season, but with Chelsea having lost all their encounters with Manchester United, Arsenal and Liverpool, a tighter affair may suit them tonight. “We don’t know what is going to happen,” Villas-Boas said. “We know last year it was a difficult, tight game, solved in the last minutes with a 2-0 win.” Villas-Boas also faces arguably the most important selection decision of his reign - whether to recall Frank Lampard after dropping the midfielder in midweek. Had David Luiz not been suspended, it may have been tempting for the Blues boss to name an unchanged XI for the first time since taking charge. With wantaway Alex banished from the first-team squad, Branislav Ivanovic will almost certainly move from right-back to centre-half today, meaning a likely recall for Jose Bosingwa. Bosingwa lost his place following a series of erratic displays and there is an argument that Oriol Romeu, Raul Meireles and Ramires would form a better defensive shield ahead of the full-back than Lampard. But Villas-Boas would only say of his selection: “We have to decide based on what we feel is best for the team in that precise moment.” One player who will expect to keep his place is Didier Drogba, who has once again become the main man at Stamford Bridge, with Fernando Torres forced to make do with a place on the bench.